Canadian dimension lumber is manufactured in accordance with CSA O141 Softwood Lumber and must conform to the requirements of the Canadian and US lumber grading rules. Each piece of dimension lumber is inspected to determine its grade and a stamp is applied indicating the assigned grade, the mill identification number, a green (S-Grn) or dry (S-Dry) moisture content at time of surfacing, the species or species group, the grading authority having jurisdiction over the mill of origin, and the grading rule used, where applicable. Dimension lumber is generally grade stamped on one face at a distance of approximately 600 mm (2 ft) from one end of the piece, in order to ensure that the stamp will be clearly visible during construction. Specialty items, such as lumber manufactured for millwork or for decorative purposes, are seldom marked. To ensure this uniform quality of dimension lumber, Canadian mills are required to have each piece of lumber graded by lumber graders who are approved by an accredited grading agency. Grading agencies are accredited by the CLSAB. NLGA Standard Grading Rules for Canadian Lumber provide a list of the permitted characteristics within each grade of dimension lumber. The grade of a given piece of dimension lumber is based on the visual observations of certain natural characteristics of the wood. Most softwood lumber is assigned either an appearance grade or a structural grade based on a visual review performed by a lumber grader. 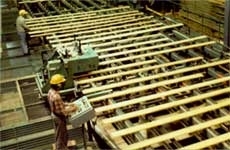 The lumber grader is an integral part of the lumber manufacturing process. Using established correlations between appearance and strength, lumber graders are trained to assign a strength grade to dimensional lumber based on the presence or absence of certain natural characteristics. Examples of such characteristics include; the presence of wane (bark remnant on the outer edge), size and location of knots, the slope of the grain relative to the long axis and the size of shakes, splits and checks. Other characteristics are limited by the grading rules for appearance reasons only. Some of these include sap and heart stain, torn grain and planer skips. 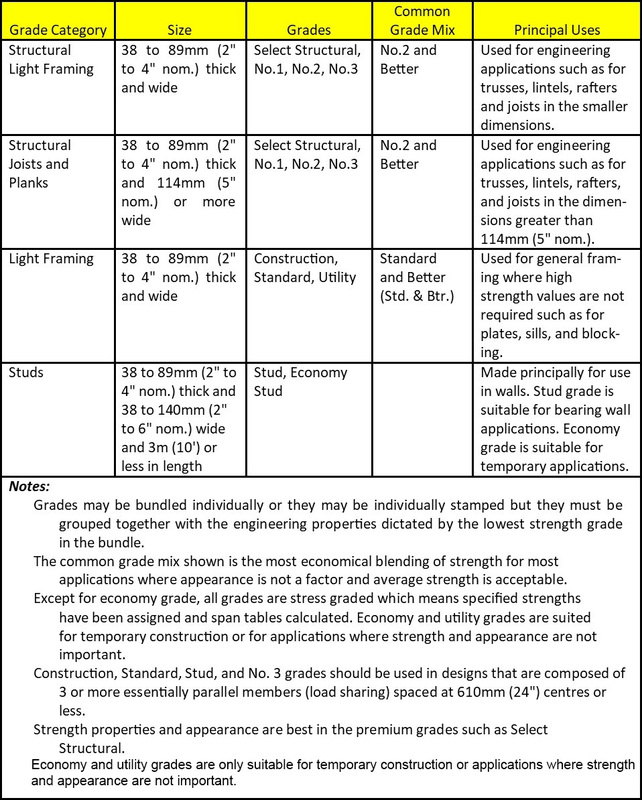 The table below shows a sample of a few of the criteria used to asses grades for 2×4 dimensional lumber that is categorized as ‘structural light framing’ or as ‘structural joist and plank’. To keep sorting cost to a minimum, grades may be grouped together. For example, there is an appearance difference between No.1 and No.2 visually graded dimension lumber, but not a difference in strength. Therefore, the grade mark ‘No.2 and better’ is commonly used where the visual appearance of No.1 grade dimensional lumber is not required, for example, in the construction of joists, rafters or trusses. Pieces of the same grade must be bundled together with the engineering properties dictated by the lowest strength grade in the bundle. Dimension lumber is aggregated into the following four grade categories: Structural light framing, Structural joists and planks, Light framing, and Stud. The table below shows the grades and uses for these categories. Download this chart as a PDF. Design values for visually graded Canadian dimension lumber in the U.S.
Design values for visually graded dimension lumber that is manufactured in Canada, but used in the U.S., is based on ASTM standard test methods in accordance with the requirements of American Softwood Lumber Standard PS20-99 and applies to species grown within Canada.